Connected was the award-winning Sundance feature film that launched the whole concept of Let it Ripple, and eventually Character Day. The 80-minute film explores questions around meaning and purpose in today’s hyperconnected world, and ends with the questions: “what’s the potential of having so many people around the globe connected through the Internet and smart devices?”, and, “if we’ve been declaring independence for centuries, what could it look like if we truly declared interdependnece?” These questions led to our first Let it Ripple film, A Declaration of Interdependence (4 mins), and ultimately our whole cloud filmmaking series (where we make films interdependently with people around the globe) that have become the backbone of our film studio Let it Ripple and our global day, Character Day. The Science of Character was the fourth film in this series. In this funny, eye-opening, and inspiring film, Director Tiffany Shlain takes audiences on an exhilarating rollercoaster ride to discover what it means to be connected in the 21st century. From founding The Webby Awards to being a passionate advocate for The National Day of Unplugging, Her love/hate relationship with technology serves as the springboard for a thrilling exploration of modern life…and our interconnected future. Equal parts documentary and memoir, the film unfolds during a year in which technology and science literally become a matter of life and death for the director. As Shlain’s father battles brain cancer and she confronts a high-risk pregnancy, her very understanding of connection is challenged. Using a brilliant mix of animation, archival footage, and home movies, Shlain reveals the surprising ties that link us not only to the people we love but also to the world at large. A personal film with universal relevance, Connected explores how, after centuries of declaring our independence, it may be time for us to declare our interdependence instead. 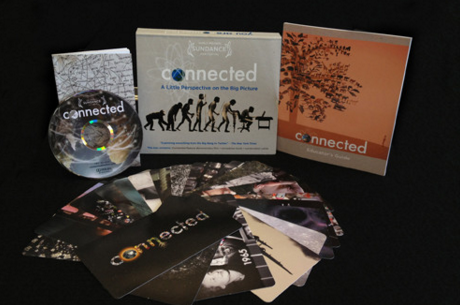 Get the award-winning film that educators around the world are using to trigger conversations about the good, the bad and the potential of all the ways we’re connected in the 21st century. We have partnered with a wonderful educational distribution team, Ro*co Educational. In a film that mixes wildly creative animation with found and archival footage, she unpacks the interrelatedness of honeybees, history, and technology — and explores the possibility of a potential shift from a left-brain to a right-brain culture. She also delves into the riches of human connection. For instance, did you know every time you make a contact with another person, even in a text message or tweet, your brain releases oxytocin, also known as “the love hormone”? The film illuminates the necessity of our interdependence and our ability to use technology to share ideas and make connections for a better world. Connected is a sagely and even delightfully presented story of our interconnectedness as a species – among ourselves, all living things, and the technologies through which extend ourselves and give substance to our imaginations, plans, and desires….in the hope it holds out for our new media, it is the kind of movie Buckminster Fuller might have made.